This is the first (but certainly not last) time on this blog I will profess a love for Paris. I know, I know: another food-lover who adores Paris. Yawwwn. But I don’t care. I’ve been there exactly once, during a semester abroad in Spain. Everyone tried to convince me I would be disappointed— that the City of Light was actually the City of Dirty Streets and Mean People. But it wasn’t. There were perfect croissants, well-coiffed women who seemed to have dabbed on Chanel No. 5 before breezing about town, street musicians, and beautiful buildings. Men walked home from work with baguettes under their arms, for heaven’s sake. Paris was everything it was supposed to be. I’ve never been anywhere else in France though, which is a shame. I feel like I would love the French countryside. The Loire Valley. Provence. Burgundy. In my (sometimes overimaginative) mind, it seems that the French country would provide rustic counterparts to all the Parisian stereotypes that were reinforced on my visit: instead of croissants, pain au levain; instead of narrow 17th-century rues, rutted dirt lanes with quaint cottages. Those are the kind of images that came to me when I read David Lebovitz‘s recipe for buckwheat Breton cakes in his lovely book The Sweet Life in Paris. Very dense, slightly spicy, and nutty with buckwheat flour, this is the kind of thing you can picture cooling on a kitchen table in some windswept seaside village in Brittany. While the recipe is written for a 9-inch cake pan, I split the batter up into small cast-iron skillets for individual cakes. Also, the real recipe calls for fleur de sel, but we’re unfortunately not schmancy enough in the Yellow House for that—a sprinkling of kosher salt gave the desired effect and should not be skipped. I served once with plain yogurt and brown sugar; and again later for breakfast with preserves. It keeps very well for several days. Cream together butter, sugar, vanilla, rum, egg yolks, and egg, in that order. Mix dry flours, 1/2 teaspoon salt, and cinnamon together; stir gradually into the butter and sugar mixture. The batter will be quite thick, almost like cookie dough. (Mine seemed too thick and dry–I actually added a splash of milk, but I think my eggs were a bit small.) Smooth batter into 4 buttered small cast iron skillets (or, alternatively, a 9-inch springform pan). Whisk together the remaining egg and milk to make a glaze. 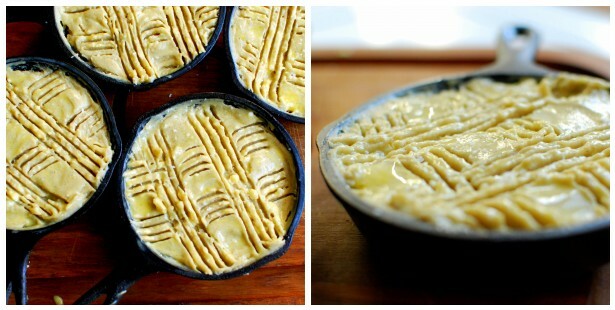 Brush it onto the tops of the cakes; then, if you want, using the tines of a fork, create a cross-hatch pattern (as pictured above). Bake for 20-25 minutes (I imagine if you made one large cake, it would take quite a bit longer). Keep an eye on it; you still want your cake to be tender, and if cooking in cast iron, it will still bake a bit more when it comes out of the oven. While still warm, sprinkle remaining 1/3 teaspoon kosher salt on top. Love those miniature cast iron skillets! I love them too. I don’t really do ‘cute’, so I’m wary of miniature things, but I’m a bit obsessed with cast iron, so I had to get them. Thanks for reading! I just bought a bag of buckwheat flour and was trying to think of what I could make with it besides crepes. Definetly will give these a try! Let me know how it turns out! Especially if you make the big cake instead of the smaller versions. I second loving the skillets! I love the french countryside. I often daydream about retiring to a little village in the south of france but that’s a long time off, for now I’ll just have to settle for making these cakes- they look wonderful. I’ve never used buckwheat before but I’ll be keeping my eye out for some. Awesome insights! I have been previously looking for something similar to this for a time now. Cheers! I have been examinating out some of your posts and it’s clever stuff. I will surely bookmark your blog. these are wonderful and have a nice light frosting- ps verity is the coolest cousin EVER!!!!!!!!!!!!! It’s pretty clear that you two are just commenting for the sake of commenting, because these have no frosting :) Nice try, and I miss you! Hope you’re having fun this weekend. Verity, you are one of the best cousins ever. People said the same to me about Paris, but it was beautiful! I’m dying to go back to visit Versailles. The people were nice, and we even got mistaken for Parisians (I wish!). This bread looks lovely for breakfast though… I have to get some small skillets. They seem good for baked eggs too. You are currently reading Breton buckwheat cakes at The Yellow House.